Epithelial ovarian cancer (EOC) is a significant cause of cancer related morbidity and mortality in women. Preferential involvement of peritoneal structures contributes to the overall poor outcome in EOC patients. Advances in biotechnology, such as cDNA microarray, are a product of the Human Genome Project and are beginning to provide fresh opportunities to understand the biology of EOC. In particular, it is now possible to examine in depth, at the molecular level, the complex relationship between the tumor itself and its surrounding microenvironment. This review focuses on the anatomy, physiology, and current immunobiologic research of peritoneal structures, and addresses certain potentially useful animal models. Changes in both the inflammatory and non-inflammatory cell compartments, as well as alterations to the extracellular matrix, appear to be signal events that contribute to the remodeling effects of the peritoneal stroma and surface epithelial cells on tumor growth and spread. These alterations may involve a number of proteins, including cytokines, chemokines, growth factors, either membrane or non-membrane bound, and integrins. Interactions between these molecules and molecular structures within the extracellular matrix, such as collagens and the proteoglycans, may contribute to a peritoneal mesothelial surface and stromal environment that is conducive to tumor cell proliferation and invasion. These alterations need to be examined and defined as possible prosnosticators and as therapeutic or diagnostic targets. The peritoneum and its structures are integral to the microenvironment of epithelial ovarian cancer (EOC). The peritoneum comprises a single layer of mesothelial cells at the surface, covering abdominal organs (visceral or serosal layer) and the abdominal and pelvic wall (parietal layer or peritoneum). About 80% of the more common epithelial ovarian cancers (EOC) involve the peritoneum or serosal surfaces as microscopic foci and visible lesions. The metastases may be exophytic with direct exposure to the peritoneal cavity and its contents or subperitoneal foci coalescing over time to form variably sized plaque-like deposits (Figure 1). Involvement of the peritoneum predicates an adverse situation for the patient that impacts significantly on prognosis as evidenced by the fact that Stage I patients have a 5 and 10 year survival of 90% , whereas patients with Stages III and IV disease have a 5 year survival of about 20%. Though most patients presenting with advanced disease show an initial response to chemotherapy, their fates are ultimately dependent upon sensitivity or resistance to chemotherapy agents or other factors. The important contributions of the tumor microenvironment to the malignant phenotype has been demonstrated in recent preclinical tumor models [2–4]. Findings from a recent study of human EOC tumors also suggest the possibility of genomic instability in nontumor tissues adjacent to growing tumor foci in EOC patients . The current review summarizes the structural and functional components of the peritoneum, which could facilitate tumor progression and metastasis. Surgical restaging by laparoscopy (peritonoscopy) and histopathologic findings showing different patterns of peritoneal involvement following prior systemic chemotherapy. (A,B) Exophytic peritoneal metastases approximately 1 cm in diameter showing multiple capillary loops. Histologic evaluation demonstrates numerous blood vessels surrounded by tumor cells. (C,D) Small 1 mm sized peritoneal metastases that are subperitoneal on histologic evaluation. (E,F) Multiple metastases about 1 cm in diameter that are growing deep to the peritoneal surface and coalescing to form plaques. Histologic evaluation demonstrates that these lesions are relatively avascular and contain significant amounts of peritumoral fibrosis. (Reprinted with permission from Cytokine, Cellular & Molecular Therapy). The peritoneum has the structure and functions of an organ that is organized for the protection of the integrity of other abdominal organs and viscera. The surface epithelium of the serous membrane of the peritoneum and serosa, is attached to a basement membrane lying on a stroma of variable thickness, and is comprised of collagen-based matrix, blood vessels, lymphatics, nerve fibers, and, in the normal state, rare hematogenous cells. A detailed description of the micro and ultra structural anatomy is described elsewhere [6, 7]. The structural and functional configuration of the peritoneum allows for an important homeostatic role through rapid mobilization of inflammatory mechanisms that can efficiently localize an injury or infection. The peritoneal surface layer has spaces or stomata between the surface mesothelial cells that could readily allow transfer of molecules or possibly cells between the stroma and the peritoneal cavity, or vice versa. Immunohistochemically documented structures in the submesothelial layer include Type I and III collagen, fibronectin, elastin, and laminin at the basement membrane stromal interface and glycosaminoglycans . Epithelial inclusions, referred to as endosalpingosis, can occur, though its cause is unknown. Ultrastructurally, both tight junctions and intercellular spaces are present. The presence of these junctions can affect the transfer of particles or cells. Molecules may transit either across or between the cells to the stromal compartment and vice versa. Peritoneal and serosal seeding is a frequent occurrence in EOC, but there is little known about the role of the multi-structured peritoneum in contributing to invasion, metastasis, and tumor proliferation. It is possible, if not probable, that critical alterations in the peritoneum surface and stroma precede either lymphatic or hematogenous spread to distant sites. In EOC patients, there may be substantial alterations to the peritoneum both at the macroscopic and submacroscopic levels. Such alterations may include thickening of the surface membrane with or without malignant ascites formation and overtly enhanced vascularity. In certain patients, the peritoneum may have a florid appearance of peritonitis with edema, enhanced vascularity, and soft adhesions. At the microscopic level, there may be multilayering of the surface epithelium (hyperplasia) and an inflammatory infiltrate comprised of different leukocyte populations. Retroperitoneal fibrosis can be extensive and can interfere mechanically with anatomic structures in extraperitoneal locations, including ureters, lymphatics, and the bowel in different locations. It would appear that a reorganization of the collagen-based matrix associated with the malignant process in EOC patients might accompany an inflammatory cell reaction. This could be similar to the situation in the peritoneum of renal fibrosis, which results in hyperplasia of the surface layer and extensive macrophage infiltrates into the stroma [8, 9]. Since the peritoneal and serosal membranes lie in proximity to the primary tumor or its metastases, the question could be asked whether soluble products of tumor masses and nodules might transfer to the normal surface mesothelial cells and penetrate the subjacent stromal tissues. Molecules such as cytokines or chemokines released from the tumor into the peritoneal cavity could possibly prime these tissues for tumor spread, proliferation, and metastasis. The peritoneum can easily permit transperitoneal passage of molecules, even up to the size of albumin, and, depending on their adherence and reactivity with stromal compartment structures, might either transfer to the capillary bed or accumulate in the subperitoneal compartment, with later entry to the lymphatics. The dynamics of molecule transfer across the peritoneum as it applies to intraperitoneal therapy pharmacology and pharmacodynamics are reviewed elsewhere . Peritoneal membrane and stromal structures exhibiting adherence properties for such molecules or cells, however, might retard their removal from this site, contributing to a sensitizing effect on the peritoneum. There is substantial data to support the presence of immune cell infiltration in EOC and its microenvironment. In earlier studies, we had shown that T cells comprised about 70% of mononuclear leukocytes in solid EOC tumors , and results from a number of experiments by us and by others suggested that the presence of these T cells could be associated with an antigen-driven immune response [12–17]. This effect is supported by the presence of clonally expanded T cell transcripts in ovarian TIL . Notwithstanding these findings, we  and others  have found little evidence for the presence of an active ongoing adaptive immunity in vivo. This is supported by the absence of IFNγ transcripts in solid tumors and their infrequent detection in ascitic T cells . Others have also reported absent CD3 TCRζ on TIL , and absent or low levels of IFNγ protein detected in ascites of EOC . It is possible that cloned T cells in the tumor environment could represent tolerized cells, though antitumor activity can be generated ex vivo when these T cells are exposed to appropriate activation stimuli [13, 14]. The presence of regulatory T cells , and certain macrophages , which are producers of IL6, IL10, and TGFβ could favor an immunosuppressive environment and may contribute to tumor progression and metastases . The role of IL10 remains to be elucidated as, depending on the status of the tumor, this cytokine can either enhance or suppress immune responses . Large numbers of monocyte/macrophages (MOMA) are also present in ascitic fluid where they may comprise 50% or more of the mononuclear leukocyte population, whereas the proportion of T-lymphocytes is usually below 40% . In recent preliminary studies, we have found that pelvic peritoneal biopsies from advanced stage EOC patients, even in the absence of tumor involvement of the specimens, also has a high proportion of MO/MA. The MO/MA in EOC comprise several subsets with the notable presence of CD14+DR- and CD14+DR+ CD16+ cells . The differentiation potential and functional capacity of these MO/MA in cancer patients is largely undetermined but clearly there are differences in the phenotypic characteristics between normal and EOC patients . Inflammatory infiltrates have long been observed in human cancer tissues, but their significance in the non-lymphomatous solid tumors has largely been ignored by pathologists and clinicians. There is increasing recognition that infiltrating immune cells may contribute to either enhancement of immunity or tumor growth and progression . Both MO/MA and T cells may have this dual role, and it remains a challenge to steer the activity of these populations toward an effective antitumor response in vivo. We have recently employed a custom-made standardized cDNA microarray that utilizes probes for 16,500 genes to conduct a pilot study on the peritoneum of patients with EOC . Biopsies were obtained at the time of peritoneal entry on patients undergoing exploratory surgery for suspected EOC. For controls, we utilized specimens of parietal peritoneum obtained at the same sites from patients undergoing surgery for suspected benign disease. Results from this study showed that the superficial layer, including the surface peritoneum and subjacent stroma specimens from the malignant group, revealed unique features at the transcript level compared to the benign group. These features are characterized by a dynamic process including cell attachments, signaling, growth stimulation, and, most importantly, a proinflammatory, pro-angiogenic, and extracellular matrix (ECM) remodeling effects. The peritoneum and subperitoneal stroma from the benign cases showed homogeneity in their transcript expression without the proinflammatory signature contrasting with some heterogeneity from patients with EOC, but an emphasis on inflammatory network responses and cell infiltrates. With increased knowledge in endothelial attachment and transcapillary migration, there is now a focus on inflammatory as well as non-inflammatory cell infiltrates and their contribution to cancer cell spread. Chemokines and certain of the larger cytokines may contribute to the migration of leukocytic and other cells into a tumor environment among their other properties. The chemokines now have a new nomenclature based on their chemical structure , and extensive reviews have been published . In EOC, particularly in studies on ascites, substantial amounts of certain CC and CXC chemokines have been demonstrated, including CCL18 (PARC), CXCL8 (IL8), CCL2 (MCP1), and CCL3 (MIP1α)  (Table 1). Transcripts for CCL4 (MIP1β), CCL5 (RANTES), CCL7 (MCP3) have been demonstrated in EOC cells  CCL13, however, is produced by ascitic macrophages and cannot be induced in EOC cells . Chemokines and cytokines may have in common potent functional properties, such as chemotaxis and proangiogenesis, and typically have effects in proximity to cells producing them. Larger cytokine molecules, such as TGFβ, may also have chemotactic and proangiogenic effects. In advanced disease, tumor cells and other cells of nontumor origin, can contribute to chemokine production. CXCL8 (IL8) is very pleiotropic and is constitutively produced or induced by both hematogenous and non-hematogenous cells and by hypoxia. We found that CXCL8 was overexpressed on the peritoneal stroma along with other network genes and appears to be a pivotal chemokine with substantial interactions at the transcript level with genes that are involved in inflammation, angiogenesis, and chemotaxis [27, 32]. Receptors for the chemokines are expressed on a variety of hematogenous cells, including T cells and macrophages . Of interest, CXCR4, the receptor for CXCL12 (SDF1), appears to be selectively expressed on EOC cells  and may contribute to tumor cell migration. There is a lack of detectable change in expression of other chemokine receptors in response to cytokines, except for CCR2, the receptor for CCL2 and certain other CC chemokines, which appears to be downregulated on EOC ascitic macrophages . This effect may interfere with migration of macrophages away from the tumor site while contributing to a tumor-promoting environment . Unlike cytokines, many chemokines may exhibit more promiscuous binding to receptors. This may insure a regional effect through their redundancy. Several cytokines have been detected in serum and ascites of EOC patients, including TGFβ isotypes, IL10, IL6, TNFα, CSF1 and IL1 [19, 36, 37, 12, 38]. TGFβ isotypes are produced by EOC cells  on mononuclear leukocytes, including CD14+DR-  and T regulatory cells . TGFβ, in its activated form, was previously considered a tumor-inhibitory cytokine but its tumor-reactive properties appear to be more complex (Table 2). TGFβ also can have a tumor promoting effect in advanced cancer possibly through activation of cdk inhibitors that block the unbinding of the pRb/E2F transcripts , and interference with TGFβ receptor binding mediated by H-Ras, as well as consequent to c-myc, its reaction with the E2F transcription factor complex . The signaling pathway of TGFβ within tumor cells may also be subverted due to mutations, or interactions with other cytokines. A TGFβ activation response might, however, prevail in the microenvironment where it may contribute to myofibroblast and endothelial cell chemotaxis, tumor adhesion, and suppression of adaptive and innate immunity . IL10 is also produced in association with EOC with a large contribution by CD14+DR- MO/MA, and these cells may function as immune regulatory cells. IL6 is expressed by EOC tumor cells as well as mesothelial cells and has been detected in the serum and ascites of EOC cells [42–45]. A recent study has shown that IL6 and MCP production by submesothelial cells can be enhanced during abdominal surgery . IL6 also enhances tumor attachment and proliferation of tumor cells, most likely through the PI 3-K activation mechanisms, and can interfere with the maturation of MO/MA to DC [44, 45]. This finding might contribute to the large number of functionally immature DC in the ascitic fluid and absent levels of IL12, a product of DC maturation [47, 48] (and C Butts' unpublished observations). Phenotypic and functional characterization of stromal inflammatory and non-inflammatory cell infiltrates will be useful for understanding the biology of metastasis. These infiltrates probably occur following transcapillary migration. In this respect, the chemical composition and dynamics of the extracellular matrix (ECM) are also likely to be important. Thus, chemokines may "stick" to other proteins in the stromal microenvironment, enhancing their chemoattraction and other properties by accumulating at these sites. Proteoglycans, which comprise a protein core, and sulphated or non-sulphated aminoglycan side chains could facilitate this. The proteoglycans include a variety of molecules, such as versican, decorin, hyaluran, and heparan with different side chains. The side chain of decorin can be of the dermatin type or chondroitin SO4 type, each having non-overlapping different functions. We have previously shown that decorin chondroitin SO4 is expressed with myofibroblasts in the adjacent stroma of EOC tissues  (Figure 2). A recent paper has shown that endothelial cells stimulated in culture on a collagen type I matrix in the presence of IL6 and IL10 synthesized decorin . This is of particular interest since both IL6 and IL10 are highly expressed in EOC. Chemokines may attach covalently to proteoglycans that express GAG sequences, while retaining their effects on tumor microenvironment cells. This may facilitate their effects locally. In contrast, proteoglycans might also interfere with the binding of activated TGFβ to its receptors. Histochemical staining of human ovarian tissue with anti-6-sulfate chondroitin or anti-smooth muscle α-actin antibody. 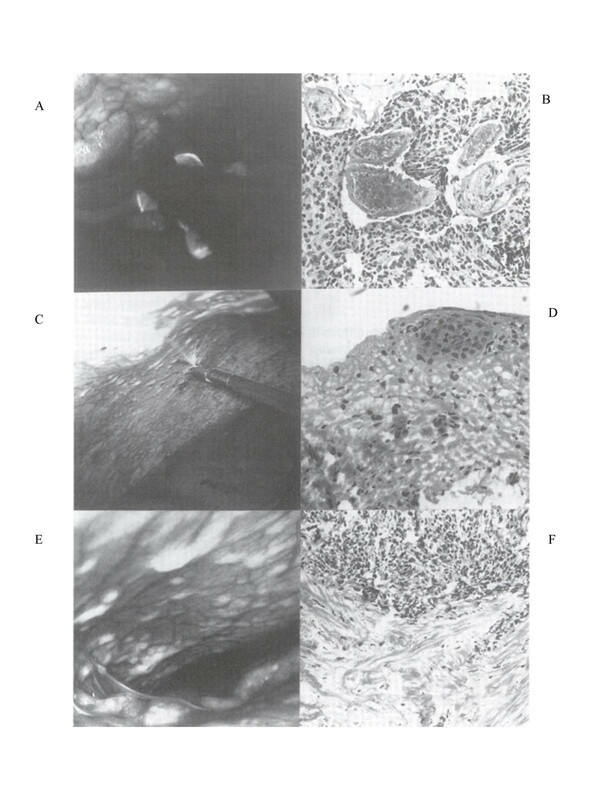 Serial 5-μm sections of paraffin-embedded tumors were stainead with anti-6-sulfate chondroitin (A) or anti-smooth muscle α-actin (B). Arrows point to regions of staining overlap. (Reprinted with permission from Clinical Cancer Research). A large family of receptors called integrins can regulate many functions at both the cellular and ECM levels. The integrins are important for the spread and proliferation of cancer cells . Their functions, however, are complex since integrins can associate with other integrins or growth factor receptors or adaptive proteins producing bi-directional effects to and from the cell membrane surface. Integrin mediated effects include cytoskeletal changes through complexing with α actinin and other proteins with downstream effects on actin. These changes may affect cell survival, proliferation, motility, and differentiation. Depending upon the particular signaling pathway dominance, the downstream effect may be either repression or activation of a particular function. Integrins may modulate or enhance the expression of other integrins and receptors, e.g. β1 and β3 integrins, which can influence apoptosis. Lack of detection of the cell-to-cell adhesion molecule E-cadherin on cuboidal cells of ovarian surface epithelium in contrast to its upregulated expression on metaplastic intra-ovarian cystic glands and early well-differentiated glandular carcinoma suggest that the latter cells may have been derived from the migrating surface ovarian cells . E-cadherin also inhibits the anti-apoptotic PI3K signaling pathway and E-cadherin expression in advanced EOC metastatic nodules appears to be less prominent than other cadherin molecules . In a 3-D model of breast cancer, chronic activation of the β1 integrin has been shown to enhance the cancer phenotype in contrast to a different signaling effect from α6/β4 integrin activation, leading to suppression of the cancer phenotype. In advanced EOC, the reduction or loss of E-cadherin expression is hypothesized to contribute to the spread and progression of the tumor . E-cadherin in both breast and ovarian cancers is considered a late tumor suppressor molecule. The importance of β1 signaling has been shown in experiments that demonstrate reversion of the malignant phenotype when β1 integrin is blocked with anti β1 mAbs . These findings overall suggest that altered expression of adhesion molecules, such as cadherein, could serve different functions during the pathogenesis of the EOC disease process. Antibody-mediated inhibition of integrin 1 has also been shown to interefere with production of decorin which is an important part of the ECM . Representative animal models of EOC need to combine the oncogenic developmental pathways as well as contributions from the cellular and ECM environment of the epithelium and stroma. This relationship, however, is clearer in established virally induced tumors . There has been some recent progress in the development of suitable mouse models for human ovarian cancer [54, 55]. Because of marked heterogeneity of ovarian cancer both at histopathologic and clinical levels, the underlying mechanisms that produce the altered gene expression profile in the EOC is not clear. However, it is reasonable to assume that the altered gene expression profile is at least in part due to activation of oncogenic events that transform the ovarian surface epithelial cells. Toward this end, it has been shown that oncogenic HRASV12 or KRASV12 activates multiple proinflammtory cytokines and angiogenic factor cytokines during the malignant transformation of ovarian surface epithelial cells in a newly created genetically defined model for ovarian cancer. In this model, introduction of SV40 T/t antigen extended the life span of primary cultured ovarian surface epithelial cells for a few more passages; however, these T/t antigen-expressing cells are still mortal. Introduction of the catalytic subunit of telomerase (hTERT) results in immortalization of these cells. Introduction of HRASV12 or KRASV12 results in transformation of these cells as reflected on the increased number of anchorage independent growth and tumor development after subcutaneous injection of these cells. Peritoneal injection of the transformed cells produced undifferentiated carcinoma or malignant mixed mullerian tumor and developed ascites, the tumor cells are focally positive for CA125 and mesothelin. Gene expression profile analysis of transformed cells revealed elevated expression of several cytokines including interleukin (IL)-1β, IL6, and IL8, that are up-regulated by the NF-κB pathway, which is known to contribute to naturally occurring human EOC. Incubation with antibodies to IL-1β or IL8 led to apoptosis in the ras-transformed cells and ovarian cancer cells but not in immortalized cells that had not been transformed. 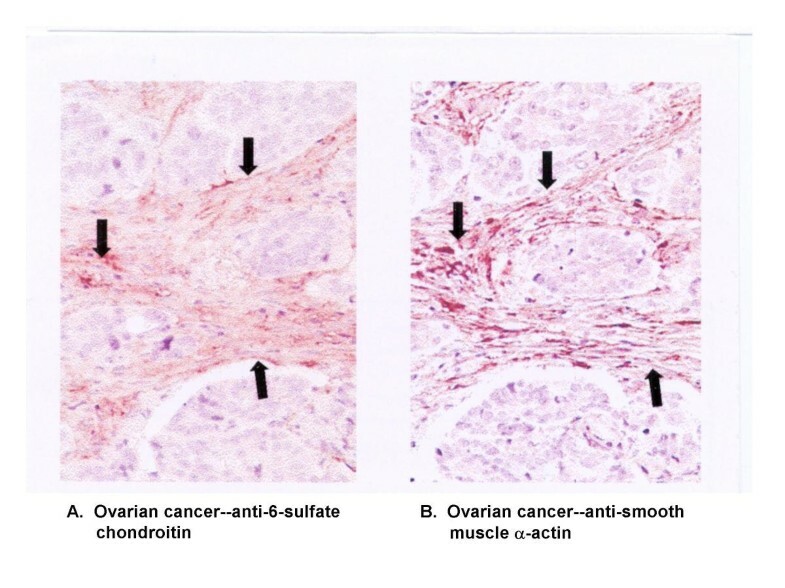 Thus, the transformed human ovarian surface epithelial cells recapitulated many features of natural ovarian cancer including a subtype of ovarian cancer histology, formation of ascites, CA125 expression, and NF-κB-mediated cytokine activation. These cells provide a novel model system to study human ovarian cancer. Because of the remarkable similarity of gene expression between the RAS-transformed ovarian surface epithelial cells and peritoneum associated with ovarian cancer, these immortalized preneoplastic ovarian epithelial cell lines may provide a valuable experimental tool to examine the role of each of the cytokines in the peritoneum during ovarian cancer development . Susceptibility of the stromal compartment of the peritoneum to proliferative signals has been well documented in animal models of the peritoneal fibrosing syndrome following exposure to chemical peritoneal dialysates [9, 56]. In these models, alterations to the stromal environment occur in response to the dialysate resulting in infiltration of two main cell populations, fibroblasts secreting MCP-1, VEGF, and HSP47 and macrophages which can express TGFβ, TNFα, IL1 and fibronectin. Macrophages in these models were shown to be recruited by several CC chemokines, MCP-1, RANTES, and MIP-1 and collagen-dependent endothelial cells. Moreover, removal of the fibroblast element in a knockout animal model abrogated the MA infiltration and the fibrotic process. A similar process has been described in renal fibrosis, which also involves mononuclear leukocytes and myofibroblasts. In EOC, it is possible that molecules derived from the primary or peritoneal surface metastases could be distributed throughout the peritoneal cavity. Even in the absence of ascites, the distribution of these molecules could possibly be facilitated by negative pressure in the peritoneal cavity and peristalsis of the intestines. The precise mechanisms underlying the formation of ascites is unknown. Ascites indicate a more advanced stage of the disease which could be a consequence of alterations in permeability of the peritoneum or extensive lymphatic obstruction. In subperitoneal metastatic growth, the ascites may be almost acellular whereas surface exophytic lesions may be accompanied by large numbers of free-floating tumor cells, mesothelial cells and leukocytes, and in some cases, the ascites has a hemorrhagic appearance. In summary, we have shown that peritoneal structures of patients with EOC are different at the transcript level from those of patients with benign conditions . The changes observed reflect alterations in cytoskeletal and signaling pathways that suggest regional activity from integrins, cytokines, hormone growth factors, and adaptive proteins. In addition, there appears to be intense chemokine activity, particularly of the CXC motif chemokines, suggesting a pattern of chemotactic influence on leukocytic as well as other cell types. Enhanced collagenase activity would contribute to remodeling of the stromal compartment and creation of a favorable environment for infiltration of leukocytes as well as other cells, such as myofibroblasts and endothelial cells. Gene profiling of the peritoneum may provide hints about early transition steps to cancer or provide insight into changes that may actually facilitate the spread of cancer to adjoining tissues. It is anticipated that future studies using high throughput technologies with a multidimensional approach will enhance understanding of these alterations and their biological significance. These efforts could help identify critical alterations in the environment surrounding the cancer and its metastases and might ultimately lead to advances in diagnosis, prognosis, and novel approaches to therapeutic targeting in EOC. The past few decades have seen considerable progress in chemotherapeutics of EOC that are contributing to an overall reduction in mortality . However, EOC is heterogenous in its histopathology and sensitivity to chemotherapy. In order to overcome redundancies in the pathways and networks that control tumor cell growth, it will be necessary to employ multitargeted therapeutic strategies. A number of peritoneal structures could serve as useful potential targets, including inflammatory and noninflammatory stromal cells, as well as production of molecules in the ECM, such as chemokines . In vitro experiments suggest that the microenvironment can influence the malignant phenotype. It is also likely that malignant cells from the primary tumor or metastasis might modify the microenvironment, preparing both surface epithelial and stromal cells to support the growth and proliferative activity of the tumor. Thus, future strategies should attempt to identify those pathways and networks in the microenvironment that are critical to tumor cell survival.